Cowboys fans must have felt pretty good when their team was up 26-3 at halftime against the Packers on Sunday. But when Dallas blew the 23-point lead and fell 37-36, it was an extra bitter loss for one Cowboys fan. 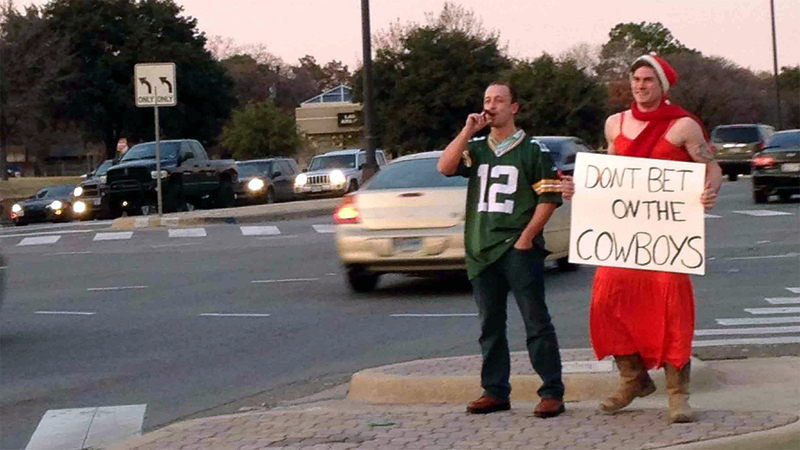 He apparently also lost a bet to his buddy who’s a Packers fan and was forced to stand at a busy intersection in a red dress while holding a sign that says "Don’t bet on the Cowboys." The Green Bay fan is clearly enjoying the moment with his cigar and a smug look on his face. Let’s hope the Cowboys fan didn’t also bet that they’ll make the playoffs. The odds are never good on that.